Caxton, William, trans. 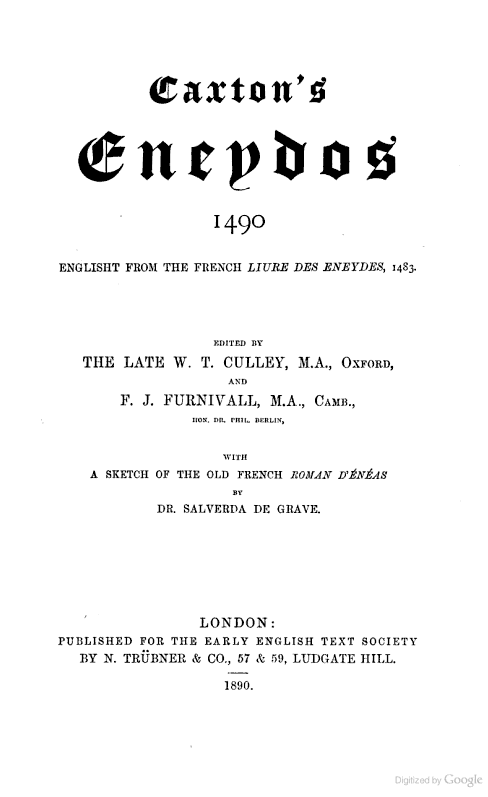 Caxton’s Eneydos, 1490, Englisht from the French Livre des Eneydes, 1483. Ed. W. T. Culley and Frederick J. Furnivall. London: published for the Early English Text Society by N. Trübner & Co., 1890. With a sketch of the old French Roman d’Énéas by Salverda de Grave. Provenance: Morris. — Richard Bennett. — Sotheby 1898, lot 245 (part; sold to Maggs for £7 10s.). — Unlocated.